The crew of the airship Kronos poses in front of the ship's helicopter. Clearly this humorous play on Victorian literature with the promise of some steampunk examples of legerdemain was right up my alley. Since my son was also a fan of magic, it seemed like catching this performance would be a wonderful father and son outing, so I ordered tickets for the next show. The Captain prepares to pass through the blades of a spinning fan. How does he do that? We arrived early and were able to snag a couple of center seats near the front of the house. The program explained that the show, divided into several acts, took place on the airship Kronos. The curtain opened and the Captain, who I later found out was Jeff Nelson, emerged. What followed was two hours of fun as the crew of the ship Kronos took us on a magical journey. The highlights included seeing a full-sized helicopter appear out of nowhere on stage; watching a girl walk through a solid steel wall and observing the Captain push himself through the spinning blades of a fan. 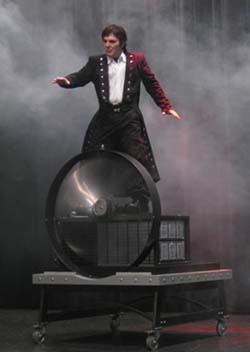 The show was unusual, not just for its steam punk theme, but because the performers worked as an ensemble featuring not one, but three accomplished illusionists: The Captain along with crew members Lynn and Sharii. In addition, other henchmen filled out the production working as various assistants and dancers. Perusing the program during the intermission, it was easy to conclude that the heart of Nelson Illusions was a family business: husband and wife, Jeff and Lynn, with daughter Sharii. This intrigued me and I wanted to know more about who they were and how they came up with their steampunk-based illusion show. Fortunately, the program included an URL and that gave me an email address for Jeff. He responded and offered to have the crew answer any questions I had, as long as I didn't ask how the magic was done. "I don't know either. I'm just the captain," he jested. As much as I would have liked to have asked him how he got through those spinning blades without being sliced and diced, I promised I would limit my inquiries to other areas. My first question was how Jeff and Lynn got into the magic business in the first place. Jeff and Lynn when they first started out in an early promotional photo. "We both had an interest in magic from childhood," they replied. "Jeff loved watching magicians on TV variety shows. Lynn's dad, who grew up in a vaudeville theater, would make little tricks for Lynn. When we met at university [they both graduated from York University's performing arts program in 1980], we started collecting tricks and working together, finally going professional after graduation." In the course of human events this eventually led to marriage and Lynn pulling off the ultimate feat of prestidigitation by conjuring up Sharii in 1993. "We're still collecting pieces for the show, but Sharii gets a say in it now," they added. Of course, Sharii didn't initially realize that her family was a bit unusual. "My parents took me with them since day one. I thought it was normal that dads would stick swords through moms and float them around till I was about six. Around then I started to realize not every kid goes to work with their parents." Sharii herself joined the troupe early. "My parents had me coming on stage since I was 18 months old taking stuff on and off. When I was five I told them I wanted to do a real magic trick. They taught me how to produce my first dove." On the road backstage Jeff relaxes while daughter Sharii, then age 13, plays on a laptop. 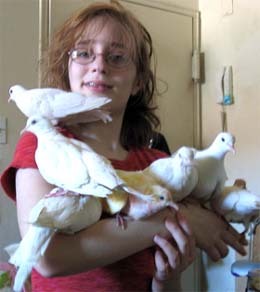 Sharii's been producing doves ever since. 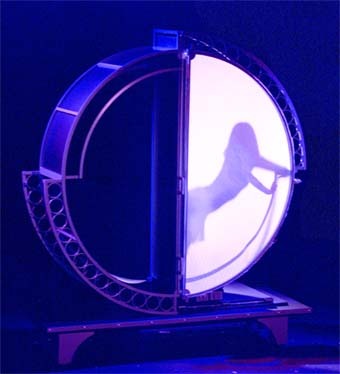 During one of her routines in the show, she materialized at least eight of them seemingly from out of thin air. Then capped off the performance by conjuring up an enormous parrot from nowhere. Of course, working with such live animals has its unexpected pleasures. "Once my blue and gold macaw, Pippin, flew into the audience and landed on a lady. She was scared of him, but he was really friendly," she told me. "The best funny moment had to be when one of my doves flew out and laid an egg in mid-air. It was like a little bomb dropping." Sharii, who is now 17, has spent most of her life doing magic and has been recognized with several honors including the Magicians Alliance of the Eastern States Best Newcomer Award for 2006. Such recognition doesn't come without effort, however, and she spends between four and six hours a day practicing. "Sharii would have missed a lot of school with our working shows, touring, and her personal practice time, so home schooling was necessary," Lynn told me. "We think it also resulted in a better overall education for her. Aside from getting a full apprenticeship in theater, she has traveled across and seen much of North America, done many things and had many interesting experiences." No school rooms, traveling the world and doing magic every day! Every kid's dream, right? Well, it's not all a bed of roses for Sharii. When most kids are out playing and enjoying the summer break, she's doing schoolwork and practicing. "The biggest shock to me was when I found out that most kids went to a place for school and they got summer off. I work summers to catch up on fall when we are really busy." Sharii loves playing historic theaters. Many have a signing wall where performers leave their autograph. Note Bob Hope's name on the upper right-hand side. Busy means moving from venue to venue and as any parent who has taken a driving vacation with small children knows, they aren't always the best travelers. "When she was very little," reported Lynn, "She was kept happy with books, modeling clay and Barbie dolls. Now she reads, works on school lessons or crochets while we travel." I asked Sharii if while traveling she ever performed in any odd locations. "Not too many unusual places but my favorite locations to perform are old vaudeville theaters. They are so beautiful and there is something wonderful about working on a stage that has housed over a hundred years of performers." What are Sharii's plans for the future as she negotiates that tricky path metamorphosing from adolescent to adult? Is college waiting in the wings? "Thanks to my parents, I am 17 and working full time in my dream job," she told me. "Unfortunately, I found out that when I stop practicing for a week it takes me a month to get back in top form. If I went to the university that would set me back years or more and sadly there is no degree in magic. I am planning to take courses part-time online. I will major in math and psychology." Posing with her feathered friends, Sharii, at age 9, takes a break at home from her practice schedule that can run from 4 to 6 hours a day. So which of these three talented magicians dreamed up the idea of a steampunk themed magic show? "We were already big fans of Steampunk, but we just didn't know it," Jeff told me. "We loved movies like Howl's Moving Castle, Twenty-Thousand Leagues Under the Sea, The Time Machine and The League of Extraordinary Gentlemen. We loved the writings of Jules Verne and H.P. Lovecraft. We loved the look of Victorian handiwork. We loved the combination of Victorian aesthetics and the concept of technology as the Victorians might have developed it had history transpired differently." Despite the family's deep interest in these things they still didn't have a name for it. It was Sharii who finally stumbled across the steampunk subculture while peursing the web. "I am a big gamer in my free time and noticed some of my favorites being a part of steampunk. So I googled it and haven't been happier since!" "Then it was like a curtain had opened, a light went on, and we finally saw something that we had always wanted and been searching for suddenly within our grasp," related Jeff. "We knew what we finally wanted to do with our show and in what direction to go with it. That was December 28th, 2009, which went down in our family history as 'Steampunk Monday.'" Actually combining magic with Victorian steampunk makes a lot of sense. The period from the mid-19th century through the early 20th century was the heyday of live performance and magic (as expressed in films like The Illusionist and The Prestige) Around the 1860's, magicians started discovering how the science of optics could help them create mind-boggling disappearing tricks that simply floored audiences. It is probably hard for us to conceive of in our world, which is filled with the illusions created by video and computer-generated imagery, the impact that such tricks had on the people of the day. Back then something that was seen was always real. Magic can be viewed and enjoyed through the medium of TV, but its natural habitat is the live performance. I asked Jeff and Lynn if this was one of the reasons they chose to go with this theme. "Partly, but more because most other magic and illusion shows we saw were stuck in the 80's in terms of style and presentation. They all looked pretty much the same and usually revolved around a single male magician. That didn't work for us because right off the top, we are a trio of magicians and two of us are female. We wanted our show to look totally different but it also had to be something we personally enjoyed and that was meaningful to us." The idea that the theme had to be interesting to the performer doing it really struck a chord with me. A couple of years ago I wrote a piece on teaching, comparing a good lesson to a good magic trick (Magic & Teaching) One of my contentions has always been that for a teacher to make a lesson interesting to a student, they must find a way of presenting it so that it also engages the teacher's own enthusiasm. Students can always tell if you are bored with a subject and are just going through the motions. It seems the same thing is true for magic and for the Nelsons to present an appealing show, they needed to find something that engaged their own interests. 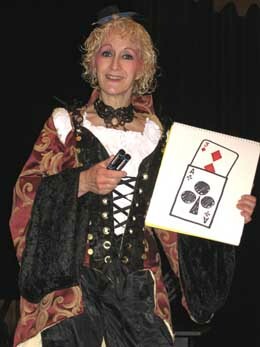 Lynn, decked out in her cool steampunk threads, pulls off a card trick. "Steampunk fit the bill," Lynn said. "It is artistic and celebrates hands-on craftsmanship (practically all our equipment is handmade). Its setting and costumes are naturally theatrical. Its what if... aspect of an alternate reality lends itself well to the presentation of magic and illusion. To top it off, Steampunk has a wide age appeal and everyone from teenagers to nonagenarians can look appropriate and really cool in steampunk threads." 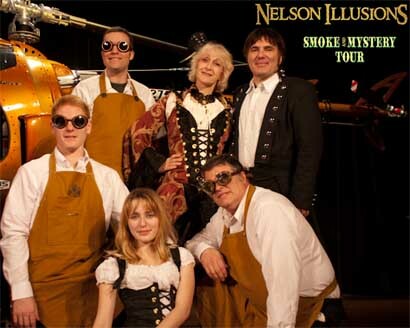 So the Nelsons came up with the idea for the Smoke and Mystery Tour and started retooling their equipment and costumes to fit the bill. This was perhaps a little easier said than done as they didn't always have the most ideal facilities for building props. "We live in an apartment community. Occasionally we build magic props and sets for the show in our apartment. Sometimes, things are just so big that we have to work on them outside on the apartment lawn and the stuff can look pretty weird. The neighbors always find this interesting, they peek at us through their windows but rarely have the nerve to come out and ask us what we are doing. We get a lot of odd looks." Along with steampunk sets, it was clear that the production would need matching music. "Steampunk Monday wasn't just about finding out about Steampunk, it was also finding steampunk music," said Sharii. "I thought it was an amazing sound and I love all the different bands. My dad (who was a performing musician and composer himself at one time) and I went over all the music. We agreed on what we needed in the show. We especially loved Abney Park's music." VIDEO: A quick look at the Smoke and Mystery Tour featuring the music of Abney Park. Now the new act is up and running and my son and I were lucky enough to catch one of the first performances. Next, the Nelsons plan to take their special brand of ensemble magic on the road, performing at various arts centers and college theaters. For more information you can check their website at www.nelsonillusions.com/ Perhaps you can catch the airship Kronos when it docks at a theater near your home. All photos are courtesy of Nelson Illusions.